December 3rd, 2018. Passed away peacefully at Mullaghboy Nursing Home. A dearly loved husband, father and grandfather. Service in S Clarke & Sons Funeral Church Newtownards on Friday at 1.00pm funeral afterwards to Movilla Cemetery. No flowers please by request. 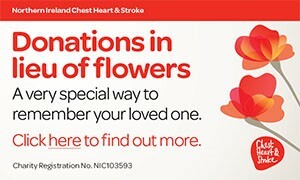 Donations may be sent if desired to N.I Kidney Research c/o S Clarke & Son Funeral Directors 12 Court Square, Newtownards BT23 7NY. Will be sadly missed by son Ricky and wife Deborah, grandchildren Richard, Kellie and Suzanne, great-grandchildren Matthew, Shannon, Becka and Ella. Beloved father of Robert and father-in-law of Rhonda. Much loved by his grandchildren Lisa and Tony and spouses Jonathan and Lisa, great-grandchildren Linus, Tilly and Edie. Will be sadly missed by his nephew Stephen, niece Tracey and families. I am sorry to tell you that Richard Irvine (Rickey) REA has passed away.